Despite returning senior Taylor Bloom and sophomore Tyler Blohm to the weekend rotation, the Maryland pitching staff’s outlook was questionable when the season started nearly six weeks ago in Knoxville, Tennessee. The Terps lost key arms after last year, creating a sense of uncertainty when the players added in the offseason formed a young pitching staff. And while Maryland hired an energetic and passionate pitching coach in Corey Muscara—who helped lead a St. John’s team that ranked in the top-10 in the nation in ERA a season ago—he was still the Terps’ third pitching coach in the last three seasons. Between the shakeup in coaching across several positions and a relatively short-staffed and inexperienced pitching arsenal, a veteran Maryland offense was presumed to be the strength that led the Terps to whatever success it achieved during head coach Rob Vaughn’s first season at the helm. That hasn’t exactly been the case, though. 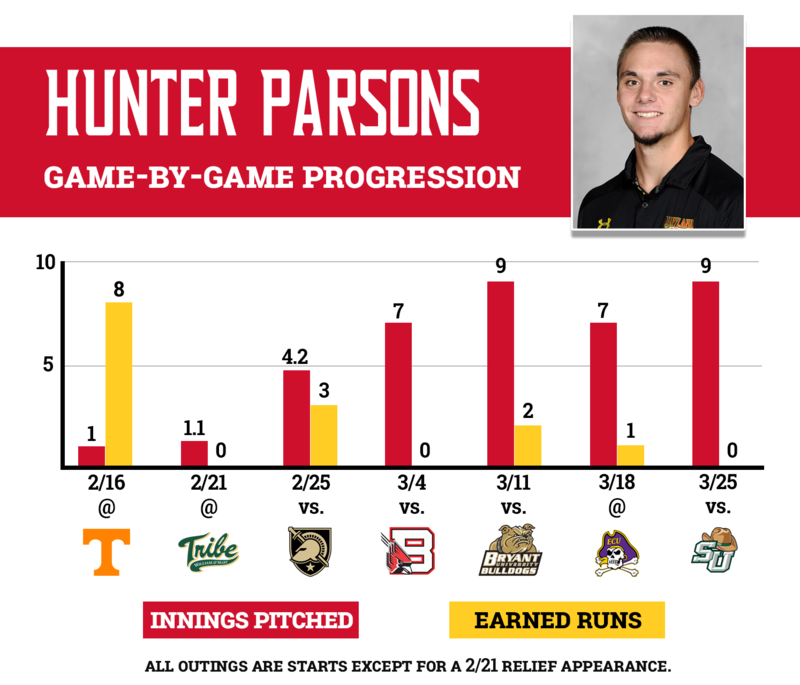 Behind strong pitching, Maryland boosted its RPI from 106 to 49 after winning two games against Stetson last weekend, a series in which its starting pitchers turned in lengthy outings and its bullpen was only utilized for 3.1 innings. Although last weekend was just a small portion of a 25-game stretch before Big Ten play, the series highlighted how the pitching staff continues to exceed expectations early in the year. Of course there’s been struggles, but many times already, Muscara has received positive results that weren’t necessarily anticipated. Parsons then worked on speeding up his pace and, using the confidence Muscara instilled in him, has gotten better every start since. He threw a two-hit complete game shutout Sunday, striking out a career-high nine batters in what Vaughn called his best collegiate start. Since his first start, Parsons is 3-1 with a 1.46 ERA, allowing just six earned runs in 38 innings. While Muscara helped Parsons with pace and confidence, changes in one of Blohm’s midweek bullpen sessions inspired his best start of the season on Saturday. Blohm, who struggled with his off-speed pitches on March 17 against East Carolina, used a looser grip on his curveball to record a career-high 12 strikeouts in eight innings against the Hatters. The southpaw’s biggest crux last season was an inability to consistently pitch deep into ballgames because of high pitch counts but, this season, Blohm has pitched at least six innings in four of his six starts, including a career-best eight innings Saturday. Muscara’s confidence in his starting pitchers extends as far as telling them they’re going to throw 105 pitches, no matter the result. This mindset has benefited the longevity of Blohm, Parsons and Friday starter Taylor Bloom’s starts this season, allowing six-plus inning starts to alleviate effects of a small pitching arsenal. Resting relievers has been easy on Friday nights with Bloom, who averages seven innings per start. While the bullpen has struggled at times, especially in midweek contests, several trustworthy relievers have emerged. Junior closer John Murphy has two saves this season, allowing just four earned runs and striking out 20 hitters in 11.1 innings, while redshirt freshman Mike Vasturia has a 1.54 ERA in his 11.2 innings after not pitching all of last season. But most unpredictably, senior first baseman Kevin Biondic has arguably been Maryland’s most consistent relief pitcher this season. Transitioning into a two-way player in the offseason, the right-hander has allowed one earned run in 11 innings — a 0.82 ERA — while holding opponents to a .105 average. So while the Terps have a 12-13 record heading into conference play Friday night against Northwestern, strong weekend pitching has led to five wins against quality competition such as Stetson, Coastal Carolina and Tennessee. Once the offense, which is averaging under five runs per game, heats up, Vaughn believes the Terps can be a dangerous Big Ten team behind their strong weekend arms.